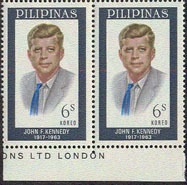 4527 VAR PHILIPPINES (1965) J.F. Kennedy*. Pair with tie shifted 2mm to the left, resulting in appearance of two ties, one in grey and one in ultramarine. Scott No 925, Yvert No 617. 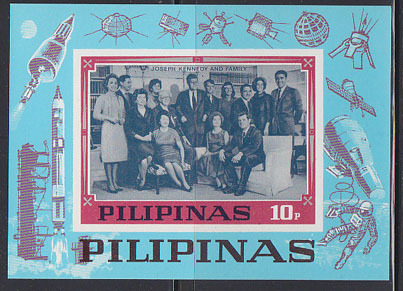 16461 VAR PHILIPPINES (1968) Kennedy family*. Imperforate S/S. This issue was canceled by the Philippine government. This S/S lacks the word AIRMAIL. 4529 VAR PHILIPPINES (1972) J.F. Kennedy*. Variety with shift of color yellow upwards giving Kennedy a halo! Scott No 1148, Yvert No 875.